Home » Prototype 4.2 MHz Omega Quartz – One of Two Made? Here’s a surprise to find inside a watch marked “Automatic”! Today, quartz watches are thought of as cheap junk, with a battery compartment being the scarlet letter in terms of value. But in the early 1970’s, quartz watches were the cream of the crop, with mechanical movements relegated to cheaper models. Omega dove into the quartz world with gusto, joining the CEH to produce the Beta series while also working on a secret internal project to outdo this mainstream effort. The Centre Electronique Horloger (CEH) in Neuchâtel was a joint effort to produce electronic intellectual property that could combat the rising American semiconductor market. The group initially focused on tuning fork movements but eventually dove into electronic quartz with gusto. In 1967, they even managed to produce the world’s first quartz wristwatch, an order of magnitude more accurate than mechanical chronometer movements. But the CEH’s production Beta 21 movement was a disappointment. It was power-hungry and clunky, quite like Seiko’s Astron and unlike the integrated quartz movements that came later. And the Swiss watch companies were more interested in producing their own movements than in sharing the same technology among their competitors. Omega was the most prolific producer of Beta 21/22-powered watches (their calibres 1300, 1301, and 1302) but their in-house calibre 1500 line was to be their ultimate quartz watch. The so-called Megaquartz 2400 boasted an eye-popping 1 second per month accuracy rating. This was thanks to a 2.4 MHz movement, quite an improvement over the 32 KHz Megaquartz 32 or 8 KHz Beta 21! But Omega wasn’t done there. 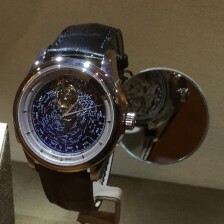 They also produced a series of marine chronometer clocks using a 4.2 MHz quartz crystal. These so-called Vega movements were even more accurate. 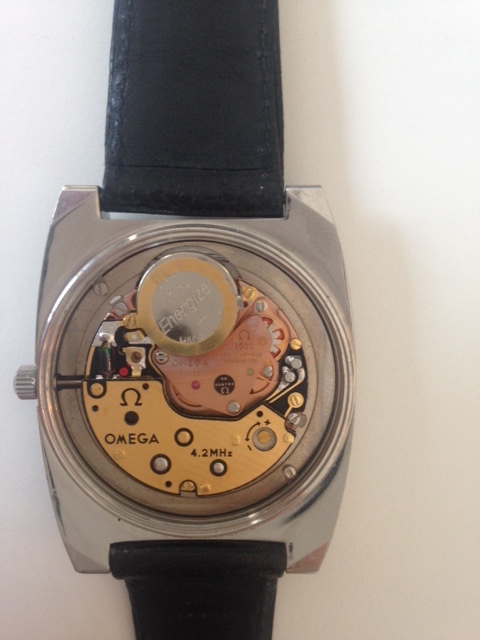 And it turns out that Omega even stuffed a Vega-based 4.2 MHz movement into a wrist watch! As discussed in this Watchuseek thread, Omega officially verified that a prototype 4.2 MHz movement was produced and stuffed into a square Seamaster case, complete with “Automatic” on the dial. It’s ironic that the round 4.2 MHz calibre was packed into a square case, since the 2.4 MHz movements were square! Back in 2012, those forum readers speculated that another 4.2 MHz Omega prototype was out there somewhere. Now it looks like it’s been found. That chunky 1970’s case hides one of two known Omega 4.2 MHz quartz movement prototypes. Since its twin was serviced and verified by Omega, I think it’s likely that this one is legitimate. This one also appears to be a later production, since the bridge includes more markings including the calibre number 1522. Auctionata is offering it as part of their Luxury Items & Treasures auction on April 7. It’s item number 63, with a starting bid of € 2,000. Although this seems steep for a 1970’s quartz watch, it could turn out to be quite a find! Their description is sparse and they inexplicably failed to include a shot of the moment, so I contacted Auctionata for details. They confirmed that it is a prototype and sent the photo featured at the top of this page. If this is legit, it’s a major find. I’m sure an Omega collector will snap this one up! I acquired this watch and I’ve got to say it is one of my top two favourites in my whole collection. Now to get a Junghans Megaquartz and a Citizen Crystron 4 Mega to complete the set!